While Facebook has its issues, I love being able to keep up with friends, see pictures of my family, and read tips for busy mommas. Just a few weeks ago, a friend posted a meal-planning tip that she created. I loved Tina’s idea and asked if she would share it with you. You won’t believe how easy this is! Eating can be really fun, but planning it can be a gigantic on-going struggle! Eighteen years of marriage and 4 kiddos later, I’ve finally formulated a plan that is w-o-r-k-i-n-g!! It’s so simple too! To get started it will probably take you about an hour and from there you can easily add to it as desired and inspired. 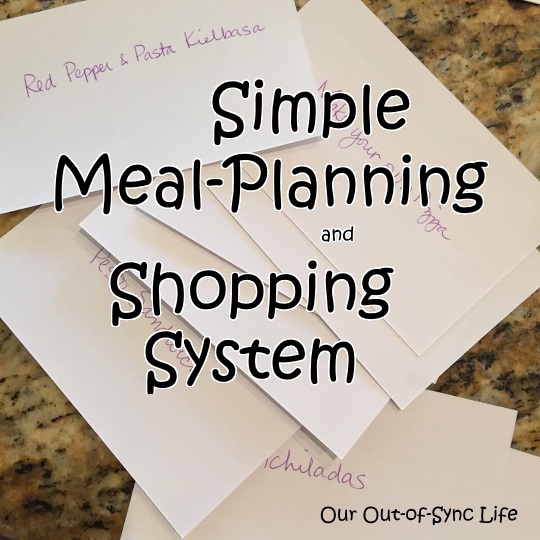 When you’re finished you’ll have a flexible meal plan and shopping list system. First, sit down and brainstorm your go-to meals, write each meal on its own notecard. 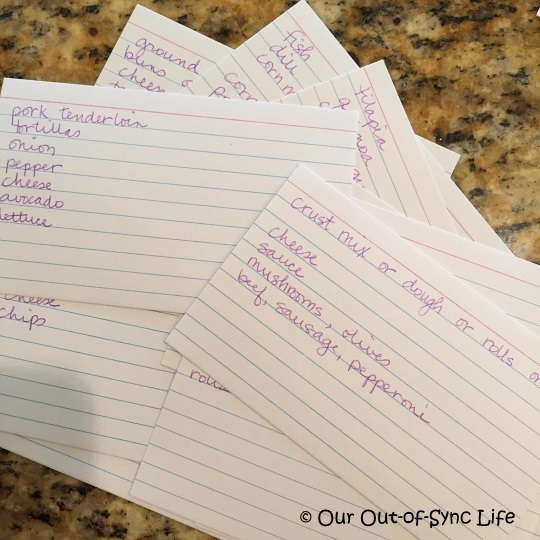 Now on the back of each card, write down what ingredients you need for that meal (I don’t write down the ingredients I typically have on hand like salt or flour, just the things I would likely need to buy i.e., ground turkey, spaghetti sauce, etc.). Also write down what possible sides (green beans, French bread, etc.) go with that meal. Next, grab 3 more notecards. Label one “Breakfast” and write down all the things your family likes for breakfast (juice, milk, cereal, pancakes, oatmeal, etc.). 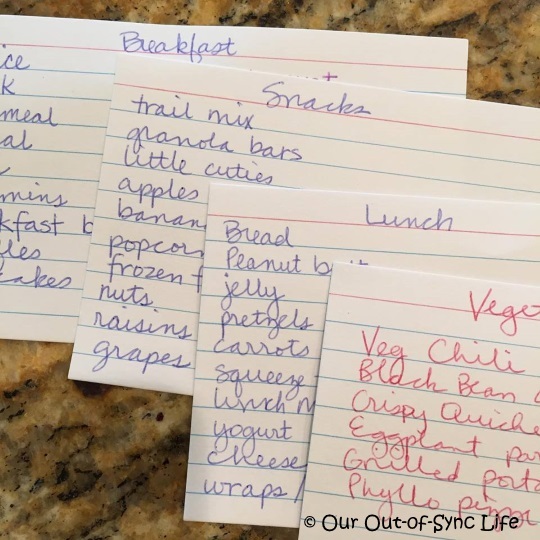 On the second card write “Lunch” and list all the things you typically have at lunch (bread, lunch meat, applesauce, chips, peanut butter, etc.). Now on the third card write “Snacks” and list as many ideas as you think of (grapes, granola bars, bananas, yogurt, nuts, pretzels, etc.). Now, refer to the back of each meal card and check the ingredients to add to your shopping list. Then take out your breakfast, lunch, and snack cards and see what you’ve run out and need to add to your list. Tada! Your list is complete and you are set for all meals and snacks for the week! You don’t have to have a ton of meals to begin with. When you come across a new recipe or remember another favorite, just add a new notecard. There are some meals my family likes to eat pretty much every week so I usually grab the taco card or make-your-own-pizza card and then add variety for the other nights. I post my cards on my magnet board and re-file each card after we have that meal. If we end up eating out unexpectedly or have leftovers then I don’t pick as many cards for the next week because I already have one or more meal(s) shopped for and planned. Go forth and meal plan! You can do this! So simple, yet so brilliant. Thank you Tina for sharing this! Update: After reading this post, Jami sent me an email letting me know about a free smart phone app called My Groceries. “It allows you to create multiple store lists, but also multiple recipes and their ingredients. So each week when I’m choosing meals, I look at the recipes I already entered, choose the one we will eat, and then once I click on the recipe, I can check which ingredients to add to which store list (based on what I do or don’t have). It’s been super helpful and quick since everything is in one place. I even have a “weekly staples” list that contains items I buy/we need weekly, like milk or eggs.” If you like apps over notecards, you might want to check this out! To get you started, below are links to my favorite, go-to recipes. You won’t believe how easy and yummy these dishes are. Give them a try and let me know what you think! I am super excited to give away 5 copies of the brand new Play-Along Bible ($12.99). 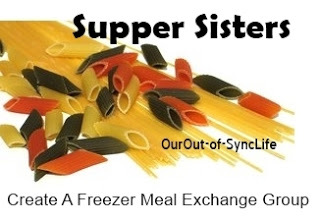 Interested in creating a Freezer Meal Exchange Group? I can’t encourage you enough! About our Guest Post Writer – Tina Munter is a stay at home of 4, who loves to find ways to run her busy home more smoothly, in budget, and point her family to God.